· Ford Lake in Southeast Michigan has suffered from nuisance algal blooms since Henry Ford built the dam on the Huron River that created the impoundment in the 1930s. · Cyanobacteria (aka blue-green algae), can pose a human health concern. Although most blue-green blooms are not toxic, some blue-green algae produce nerve or liver toxins. Toxicity is hard to predict in part because a single species of algae can have toxic and non-toxic strains. Also, a bloom that tests non-toxic one day can turn toxic the next day. · Dr. John Lehman, a professor in the University of Michigan’s Department of Ecology and Evolutionary Biology, and his research team discovered that phosphorus that is trapped in the lake sediment is released and stirred up when the lake mixes. When this occurs during a period of low oxygen in the lake, cyanobacteria (aka blue-green algae) are propagated. · Dr. Lehman discovered in 2006 that by manipulating when and how water is discharged by the dam, the conditions that lead to nuisance algae could be prevented. 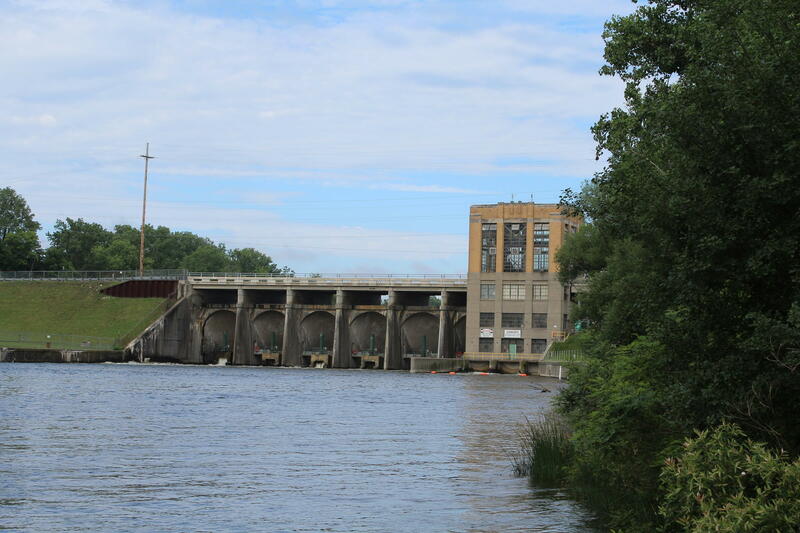 In 2012, due to an unusually dry summer, the dam could not be used to selectively churn the water, and the algae returned—despite local phosphorus discharge ordinances that led to lower levels in the Huron River. · Starting in January 2012, a new Michigan Law, Public Act 299 of 2010, took effect. It prohibits the application of fertilizers containing phosphorus to turf grass (with exceptions). · Blooms of toxic algae occur are most common in late summer or early fall. Dr. Lehman says that, in August of 2017, conditions that could have produced cyanobacteria were possible, but due to pro-active management with the dam and the presence of diatoms, he expects the water to be transparent and free of a significant outbreak for this year. Michigan would generate 50% of its electricity from clean, renewable sources by 2035 and greatly reduce energy waste under legislation under consideration in Lansing. The package of bills aims to reduce energy costs, create jobs and build upon recently enacted energy laws. In this month’s edition on “1st Friday Focus on the Environment,” WEMU’s David Fair discusses the issues with the Government Affairs Director for the Michigan League of Conservation Voters, Charlotte Jameson and with 52nd District State Representative Donna Lasinski (D-Scio Township), who is a co-sponsor of the house bills. After narrowly defeating a similar proposal one year ago, Ypsilanti voters have approved a millage increase to pay off debt from the failed Water Street redevelopment project. Lisa Barry reports on the passing of the Water Street millage in the Ypsilanti primary election. Algae blooms have been problematic in Michigan, especially in Lake Erie. In this month's "First Friday Focus on the Environment," WEMU's David Fair talks to Lisa Wozniak, executive director of the Michigan League of Conservation Voters, and Jim Byrum, president of the Michigan Agri-business Association, about ways to keep algae blooms from growing out of control.